They were known as the “book women.” They would saddle up, usually at dawn, to pick their way along snowy hillsides and through muddy creeks with a simple goal: to deliver reading material to Kentucky’s isolated mountain communities. 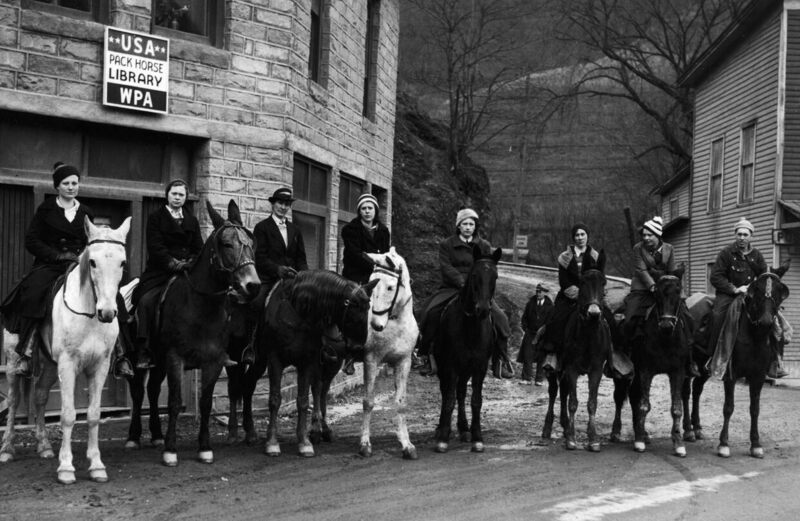 The Pack Horse Library initiative was part of President Franklin Roosevelt’s Works Progress Administration (WPA), created to help lift America out of the Great Depression, during which, by 1933, unemployment had risen to 40 percent in Appalachia. Roving horseback libraries weren’t entirely new to Kentucky, but this initiative was an opportunity to boost both employment and literacy at the same time. A pack horse librarian at an isolated mountain house, carrying books in saddle bags and hickory baskets, year unknown. University of Kentucky Libraries Special Collections Research Center. Old magazines and newspapers were cut and pasted into scrapbooks with particular themes—recipes, for example, or crafts. One such scrapbook, which still is held today at the FDR Presidential Library & Museum in Hyde Park, New York, contains recipes pasted into a notebook with the following introduction: “Cook books are popular. Anything to do with canning or preserving is welcomed.” Books were repaired in the libraries and, as historian Donald C. Boyd notes, old Christmas cards were circulated to use as bookmarks and prevent damage from dog-eared pages. Pack horse librarians start down Greasy Creek to remote homes, date unknown. University of Kentucky Libraries Special Collections Research Center. By the end of 1938, there were 274 librarians riding out across 29 counties. In total, the program employed nearly 1,000 riding librarians. Funding ended in 1943, the same year the WPA was dissolved as unemployment plummeted during wartime. It wasn’t until the following decade that mobile book services in the area resumed, in the form of the bookmobile, which had been steadily increasing in popularity across the country. Pack horse librarians cross a log bridge to reach home used as a distribution center for a mountain community, year unknown. University of Kentucky Libraries Special Collections Research Center. Atlas Obscura has a selection of images of the Kentucky pack horse librarians. The library in Stanton, Kentucky, 1941. University of Kentucky Libraries Special Collections Research Center. Packing saddle bags with books, date unknown. University of Kentucky Libraries Special Collections Research Center.